The purpose of the visits between Maldivian and Sri Lankan delegates varied from paying neighbourly courtesies, such as a Special Envoy of the President of the Maldives presenting financial assistance to Sri Lanka in the aftermath of floods in 2017, and the President of Sri Lanka visiting the Maldives for the Golden Jubilee of its Independence.7 Visits between the foreign ministers focused on economic and security issues, reiterating a need for increasing cooperation on improving tourism investments, education linkages and fishing issues. Diplomatic cooperation could also involve the prospects of sharing embassies or, an agreement by which Maldivians can seek help from Sri Lankan embassies in countries the Maldives does not have a mission. On security matters, the coastguards of the Maldives and Sri Lanka should sign an MoU to establish a system of communication and information sharing, that would allow more effective monitoring of the Indian Ocean for criminal activity. Ideally, such a security agreement would become a trilateral one, which includes India and eventually be extended into multilateral agreement with Seychelles, Mauritius and other Indian Ocean littoral states. A key dimension to security issues is enforcing and strengthening the framework of international system of laws that the world built up since the Second World War. The Maldives and Sri Lanka should vocally support the international forums that enforce and support these principles. Building on the long history of organic trade and commerce between the Maldives and Sri Lanka, Sri Lanka and the Maldives should focus on its comparative advantages – Sri Lanka should focus on exports to the Maldives, as well as policy to undercut India’s medical tourism. Sri Lanka’s education services should be offered in order to improve the Maldives’ human capital and skills. At the same time, business between private companies should be encouraged. The Maldives should implement policy to attract investment to diversify its economy. Fences make poor neighbours in a globalised world, where wealth and security are enhanced through open relations. Sri Lanka should use the opportunity presented by new government in the Maldives, to strengthen its diplomatic, economic, and security ties with its neighbours. Through coordination of policy, both nations could work towards achieving their goals of greater prosperity and wellbeing for their citizens. 1Daily FT. (2019). Maldives President notes importance of relationship with Sri Lanka. [online] Available at: http://www.ft.lk/news/Maldives-President-notes-importance-of-relationship-with-Sri-Lanka/56-670191 [Accessed 9 Jan. 2019]. 2Embassy of Maldives. (2016). Embassy. [online] Available at: http://maldivesembassy.lk/embassy/embassy [Accessed 17 Jan. 2019]. 3Nuclear Threat Initiative. (2019). South Asian Association for Regional Cooperation (SAARC) | Treaties & Regimes | NTI. [online] Available at: https://www.nti.org/learn/treaties-and-regimes/south-asian-association-regional-cooperation-saarc/ [Accessed 17 Jan. 2019]. 4Ministry of Foreign Affairs of the Maldives. (2017). Fosim Quarterly. [online] Available at: https://foreign.gov.mv/images/fosim/Fosim_Qtrly_v3.pdf [Accessed 17 Jan. 2019]. 6Ministry of Foreign Affairs of Sri Lanka. (2018). Visits | Ministry of Foreign Affairs Sri Lanka. [online] Available at: https://www.mfa.gov.lk/visits/ [Accessed 3 Nov. 2018]. 8LA Times. (2018). Los Angeles Times. [online] Available at: http://articles.latimes.com/1999/oct/16/news/mn-22894 [Accessed 6 Dec. 2018]. 9European Commission. (2018). Home Consular Protection. [online] Available at: https://ec.europa.eu/consularprotection/index.action_en [Accessed 6 Dec. 2018]. 10China South China Morning Post. (2018). China and Maldives sign free trade, maritime deals. [online] Available at: https://www.scmp.com/news/china/diplomacy-defence/article/2123389/china-and-maldives-sign-free-trade-maritime-deals [Accessed 6 Dec. 2018]. 11Ramachandran, S. (2018). The Maldives’ New Government: Mission Impossible?. [online] The Diplomat. Available at: https://thediplomat.com/2018/10/the-maldives-new-government-mission-impossible/ [Accessed 18 Oct. 2018]. 14Aryasinha, R. (1992). Indo-Maldives Relations and the Relevance of the Sri Lanka Factor. In: B. Bastiampillai, ed., India and her South Asian Neighbours. Colombo: Bandaranaike National Memorial Foundation, pp.91-116. 15DeSilva-Ranasinghe, S. and Sutton, M. (2015). Challenge for Maldivian Coastguard: Indian Ocean Security. Naval Institute. Available at: https://navalinstitute.com.au/challenge-for-maldivian-coast-guard-indian-ocean-security/ [Accessed 1 Dec 2018]. 19Saberwal, A. (2016). Time to Revitalise and Expand the Trilateal Maritime Security Cooperation between India, Sri Lanka and Maldives. [online]. Institute for Defence Studies and Analyses. Available at: https://idsa.in/idsacomments/trilateral-maritime-security-cooperation-india-sri-lanka-maldives_asaberwal_220316 [Accessed 1 Dec 2018]. 20Memorandum of Understanding between the Coast Guard of the Republic of India and the Coast Guard of the Democratic Socialist Republic of Sri Lanka for the Establishment of a Collaborative Relationship to Combat Transnational Illegal Activities at Sea and Develop Regional Co-operation between the Indian Coast Guard and the Sri Lanka Coast Guard. (2019). [online] Ministry of External Affairs of the Government of India. Available at: https://www.mea.gov.in/Portal LegalTreatiesDoc/LK18B3322/.pdf [Accessed 9 Jan. 2019]. 21CIA World Factbook. (2018). Maldives. [online] Available at: https://www.cia.gov/library/publications/the-world-factbook/geos/mv.html [Accessed 6 Dec. 2018]. 22World Integrated Trade Solution. (2018). 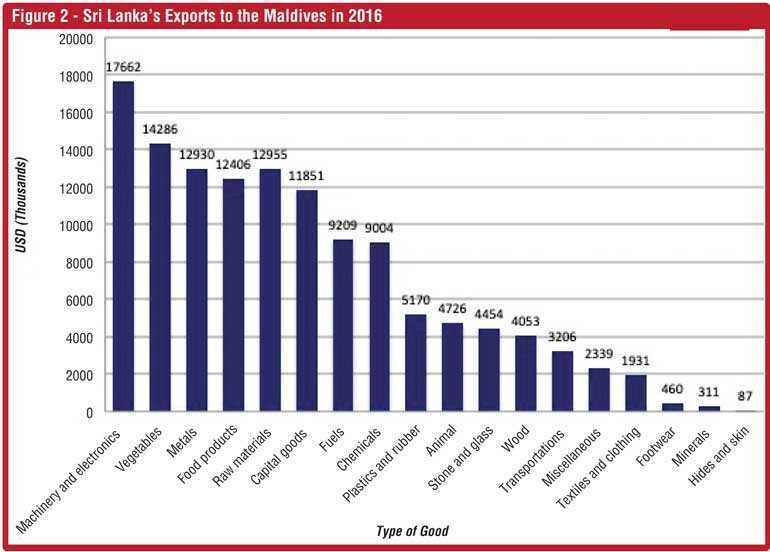 Sri Lanka Exports by Country and Region 2016. 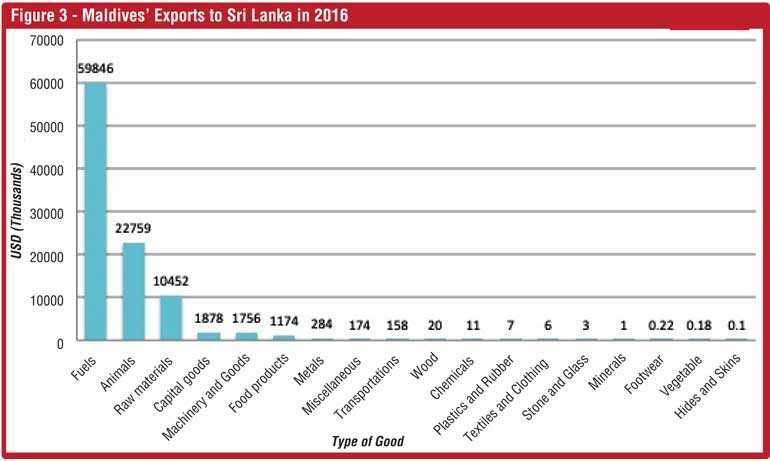 [online] Available at at: https://wits.worldbank.org/CountryProfile/en/Country/LKA/Year/LTST/TradeFlow/Export/Partner/all/ [Accessed 3 Nov. 2018]. 24The World Bank. (2018). GDP per capita. [online]. https://data.worldbank.org/indicator/NY.GDP.PCAP.CD [Accessed 6 Dec. 2018]. 26Household Income and Expenditure Survey. (2016). National Bureau of Statistics. Available at: http://statisticsmaldives.gov.mv/nbs/wp-content/uploads/2016/03/HIES-Report-2016-Income-Updated.pdf [Accessed 1 Jan. 2019]. 27Ministry of National Policies and Economic Affairs Sri Lanka. (2019). [online] Available at: http://www.statistics.gov.lk/HIES/HIES2016/HIES2016_FinalReport.pdf [Accessed 9 Jan. 2019]. 28Tourism Sector Comparison. (2018). [ebook] Sri Lanka Tourism Development Authority. Available at: http://www.sltda.lk/sites/default/files/tourism-sector-comparative-analysis-2017.pdf#page=2 [Accessed 3 Nov. 2018]. 29Flow of Tourists by Nationality. (2018). [ebook] Statistics Maldives. Available at: http://statisticsmaldives.gov.mv/yearbook/2018/wp-content/uploads/sites/5/2018/03/10.1.pdf#page=1 [Accessed 3 Nov. 2018]. 30Tourism Sector Comparison. (2018). [ebook] Sri Lanka Tourism Development Authority. Available at: http://www.sltda.lk/sites/default/files/tourism-sector-comparative-analysis-2017.pdf#page=2 [Accessed 3 Nov. 2018]. http://www.mma.gov.mv/documents/Maldivians%20Travelling%20Abroad%20Survey/2017/MTA-Survey-2017.pdf [Accessed 3 Nov. 2018]. 33Oanda (2019). Currency Converter | Foreign Exchange Rates | OANDA. [online] Available at: https://www.oanda.com/currency/converter/ [Accessed 8 Jan. 2019]. 36Bureau of Immigration. (2019). VISA Requirement. [online] Available at: https://boi.gov.in/content/visa-requirement [Accessed 8 Jan. 2019]. 37Samir, A. (2019). Maldivian Citizens Visiting Malaysia Will Be Granted 90 Days Visa on Arrival - MFA. [online] Foreign.gov.mv. Available at: https://foreign.gov.mv/index.php/en/mediacentre/news/1963-maldivian-citizens-visiting-malaysia-will-be-granted-90-days-visa-on-arrival [Accessed 8 Jan. 2019]. 38The Edition. (2018). Four universities offer higher education scholarships to Maldivian students. [online] Available at: https://edition.mv/news/4932 [Accessed 6 Dec. 2018]. 39University of Colombo, Sri Lanka. (2018). University of Colombo to train statisticians of National Bureau of Statistics, Maldives and Maldivian National University under UNFPA funding. [online] Available at: https://cmb.ac.lk/index.php/university-of-colombo-to-train-statisticians-of-national-bureau-of-statistics-maldives-and-maldivian-national-university-under-unfpa-funding/ [Accessed 6 Dec. 2018]. 40Daily FT. (2014). Brown Investments, Palm Garden Hotel and Eden Hotel in JV to acquire Maldives resort. [online] Available at: http://www.ft.lk/article/378711/Brown-Investments--Palm-Garden-Hotel-and-Eden-Hotel-in-JV-to-acquire-Maldives-resort- [Accessed 6 Dec. 2018]. 41Daily Mirror. (2018). Maldivian company to invest US$ 3 mn in luxury chalets. [online] Available at: http://www.dailymirror.lk/76829/maldivian-company-to-invest-us-3-mn-in-luxury-chalets [Accessed 6 Dec. 2018]. 42Daily News. (2018). Coral Properties Invests Rs. 9 bn in Sri Lanka and Maldives. [online] Available at: http://www.dailynews.lk/2018/08/20/business/160075/coral-properties-invests-rs-9-bn-sri-lanka-and-maldives [Accessed 6 Dec. 2018]. 43Maldives Independent. (2018). Champa Brothers issued banking license. [online] Available at: https://maldivesindependent.com/business/champa-brothers-issued-banking-license-124272 [Accessed 6 Dec. 2018]. 44Asian Development Bank. (2018). Maldives: Economy. [online] Available at: https://www.adb.org/countries/maldives/economy [Accessed 26 Dec. 2018]. 46Unescap. (2019). Broadband Infrastructure in South Asia and West Asia. [online] Available at: https://www.unescap.org/sites/default/files/Bhutan%20Presentation.pdf [Accessed 1 Jan. 2019].